GATI is one of the well known courier and logistics solution service, with major courier courier business in India and other places around, apart from a few others like Blue Dart, DTDC etc. but none would promise to deliver the couriers and parcels at the right time, as delays do happen always. But many a times, people complain of their courier gone missing completely, and no sign of it getting delivered. 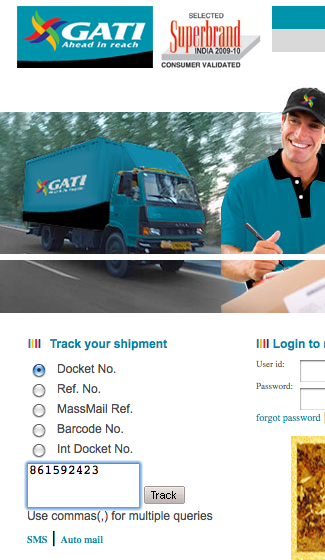 Open the GATI shipment website. There you would see the section “Track your shipment” and here you need to enter the docket number of your shipment. There are various options, like Docket number, Reference number, Massmail reference, Barcode number or the international docket number. Enter the one depending on your shipment type. You can enter multiple queries by adding with a comma. The tracking page shows all the required information of the current location of the shipment, and the dates when the shipment was at the major notable locations. This can easily assist you in ensuring that the shipment is being correctly being sent to the destination. With this you can keep a track of the shipment by receiving the automated emails whenever the shipment reaches a new major area. Go to this page and enter your Docket Number, and email address. This would also come to use when sometimes the shipment is shown undelivered in the web tracking system, then you can send your email address to receive the explanation and exact location of the shipment. If you are registered to GATI website, which you would have done if you directly sent a shipment instead of using any 3rd party shopping site, just after logging in you need to click on “Automail Info” or “Docket Summary” and enter the email ID. 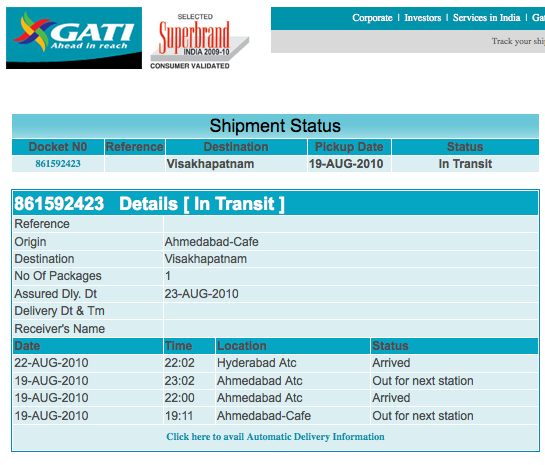 Send an SMS as to 9841001313 and you would instantly receive the current status of the shipment. But that’s just once, and you won’t be updated continuously, unless you keep sending the SMSes. Here is how you can track DTDC courier status online.